There are several days of military honor in Russia, and one of them falls on December 5, that is Battle of Moscow Day. Commemoration of this day is connected with the events of October-January 1941-1942, when the Soviet troops defended and then launched the counteroffensive against Nazi Germany. 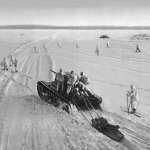 The Battle of Moscow is the Russian name given to the strategically significant periods of fighting, that took place between October 2, 1941 and January 7, 1942. Germany launched Operation Typhoon to conduct two offensives on the north and south of Moscow. At the beginning the Soviet army only conducted strategic defense of the Moscow Oblast, but on December 5 it launched the counteroffensive against Germany. The Soviet army started making progress and liberate villages, towns and cities near to Moscow. The Russian counteroffensive operation was successful and it drove the Nazi troops away from the capital. Interference with Hitler's plans consequently enabled defeat of Nazi Germany in 1945.